Amethyste brings to mind one word: chic. This villa isn’t fussy or frou frou, but the design sets it apart from other villas. 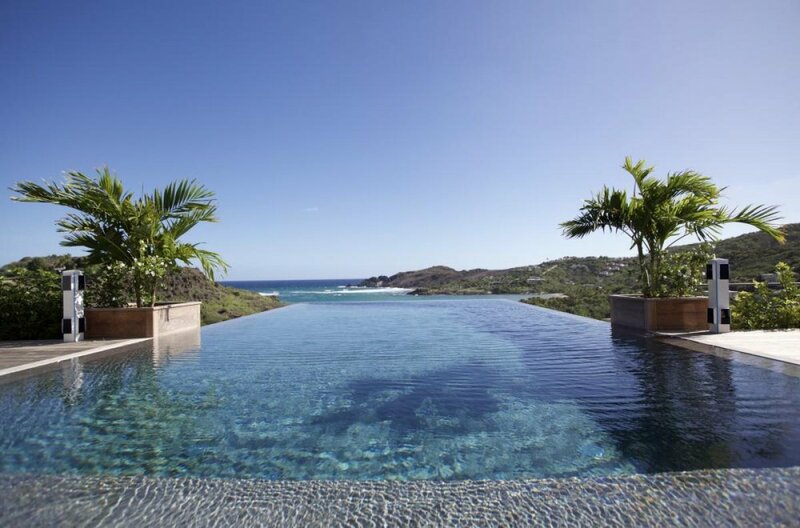 I can’t get enough of the ocean view by the pool, the horizon goes on forever and the hills of St Barth surround the villa. This is perfect for those who want to kick their luxury vacation up a notch. Amethyste Villa takes luxury to another level thanks to its chic design and coastal views. Multiple outdoor seating areas show off the breathtaking ocean view of the St Barth hillside, and an outdoor dining area means you rarely have to leave the patio. The infinity pool overlooks the bay. Two equally sized bedrooms have incredible views of the coast, as they flank opposite sides of the living and dining area. Both have an indoor and outdoor shower, a double vanity, and the option to have a king bed. On the lower level, a fitness room with a view allows you to workout while taking in the island, and the cinema room provides an indoor retreat or additional bedroom. The lower level also has a separate bathroom and shower. The open living and dining area provides seating for everyone in your party, and the kitchen island doubles as a bar. If you choose to eat out rather than dine in, the nearest restaurants are only a 5 minute drive from the villa.